Created by Fred Bricon on Nov 23, 2011 10:51 AM. Last modified by Martin Malina on Aug 10, 2012 5:13 AM. 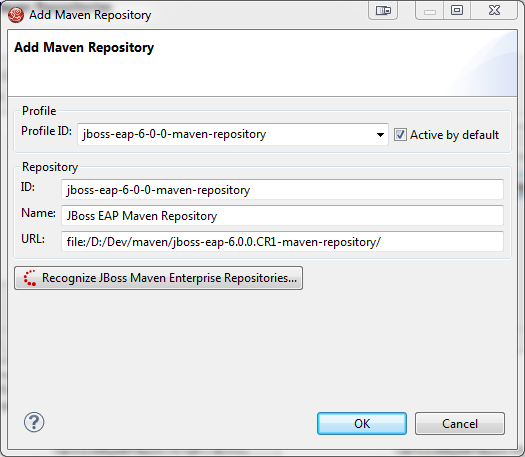 If your application requires the JBoss Enterprise Maven Repositories (EAP6, WFK), you need to make sure Maven knows about them. 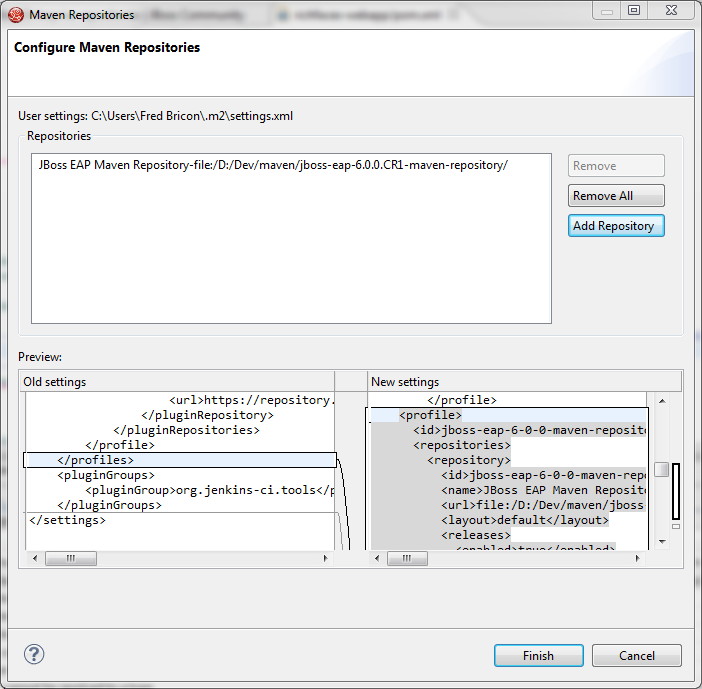 If you haven't setup an Enterprise Repository Manager to mirror the JBoss Enterprise Maven repositories, you will need to download and install them locally, following these instructions. 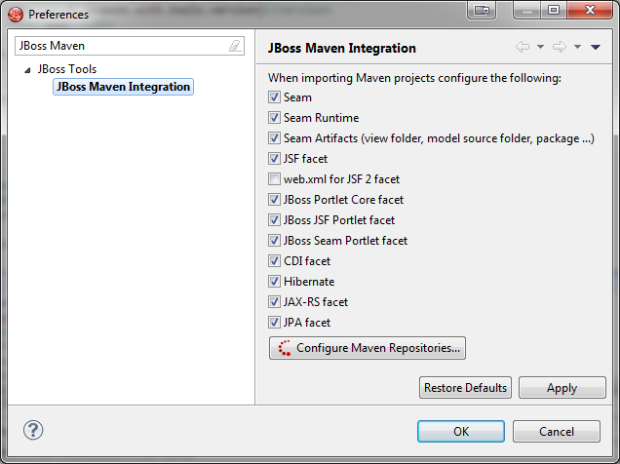 You can then either chose to use the JBoss Tools / JBDS Maven Repositories Wizard to configure your Maven settings or do it completely manually. The wizard lists all the repositories in your settings. Click on the "Add Repository..." button to add a new entry. 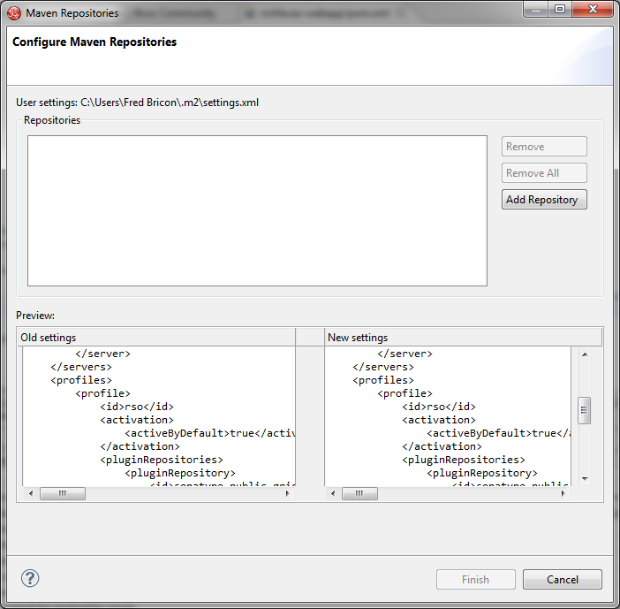 The "Add Maven Repository" dialog starts empty. 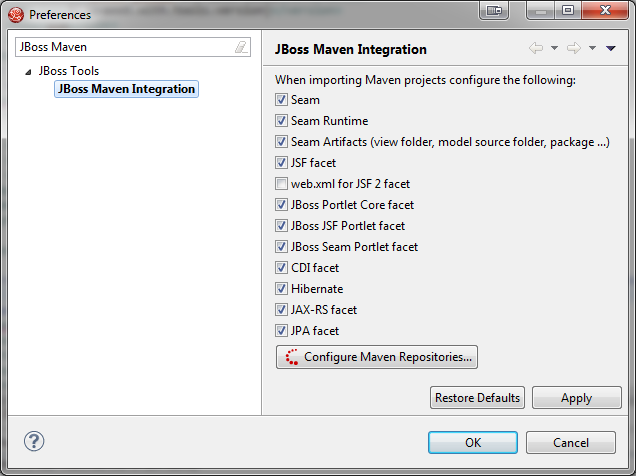 Clicking on "Recognize JBoss Maven Enterprise Repositories..." will let you select the location of the maven repository you unzipped on your disk. The wizard will automatically determine if it's a EAP or WFK repository. Clicking on "OK", you'll see a preview of the modifications that will be performed on your settings : a new profile containing the new repository will be added. 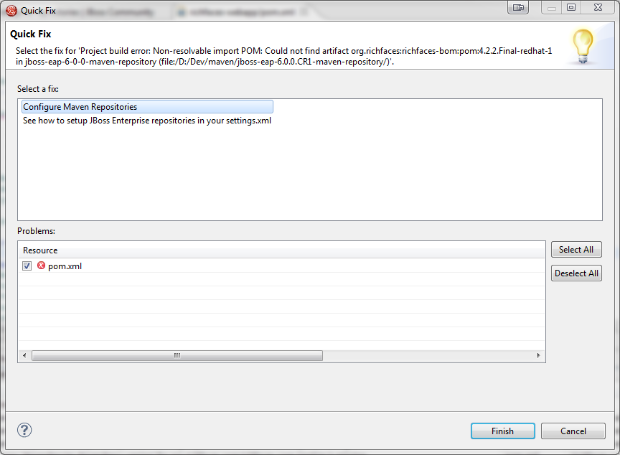 Clicking on finish, you'll be asked if you really want to proceed and modify the settings.xml. Copy the following code sample into settings.xml, substituting the URL for your path to the repository: Create a profile for each JBoss Enterprise repository you have (EAP, WFK).